It's exciting that the United States Postal Service will be honoring ten great Twentieth-Century Poets in their forever stamp issues for 2012. The group includes winners of numerous Pulitzer Prizes, National Book Awards, and honorary degrees: Elizabeth Bishop, Joseph Brodsky, Gwendolyn Brooks, E.E. 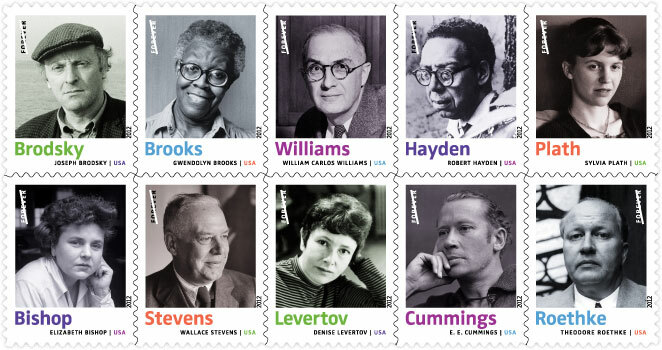 Cummings, Robert Hayden, Denise Levertov, Sylvia Plath, Theodore Roethke, Wallace Stevens and William Carlos Williams. Most honorees are American with the exception of Joseph Brodsky who exiled from the Soviet Union and became the first foreign-born Poet Laureate of the United States. The reverse pane of the stamps will include an excerpt from one poem by each poet. Read entire E.E. Cummings poem here.